This week we take our second step along the Calderdale Way thanks to www.casualramblers.co.uk and travel 3.25 miles across Norland Moor to the conservation area at Ripponden. Crossing Norland Moor, distant views of Millbank framed by Crow Hill and Great Manshead indicate the route ahead before the road drops steeply to the conservation area in Ripponden with its Pennine Farm Museum. 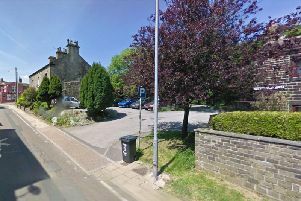 The route can be joined on a link path from Sowerby Bridge past the Moorcock Inn, and can be shortened in the event of bad weather, by following Highlee Lane to Kebroyd, then direct to Millbank via Clapgate Lane. From Clough Moor Bridge, follow the signed path on Norland Moor: cross the stream and aim for a squat pylon. Turn left by a wall along the stream, passing a clump of trees on the left before reaching a fenced enclosure. Here you will find a Cairn pointing the way along a clearly defined track. The stones of the cairn are securely cemented in place. The fine display of heather on the moor is beginning to fade. Cross the moor all the way to the end, then turn left on reaching the disused waterworks. This is on top of what I assume is a disused reservoir, and the two rectangles look superficially like access covers. However the frames look relatively new, perhaps stainless steel, and each contains a pool of clear water with what looks like the top of the concrete slab as a bed. Follow the edge as you reach Ladstone Rock. A reference point on the splendid Calderdale Way. Over to the right is Sowerby Bridge, in the valley below. Continue along the moor edge where the path drops down to the road below. Follow the route all the way until you reach the main road. Here bear left towards the New Rock Inn. Here the path takes you across the field to a better track and eventually on to the main road. Turn right and head downhill. Further down the road, the Fleece Inn is visible on the right, just before a fork in the road. Well placed near the top of a long, steep hill. Take the right hand fork all the way to the bottom, where you will emerge in front of the Church in Ripponden. This is the old road from Ripponden Bridge to Elland. Carry on past the Church, which takes you across the river to a very old pub, called The Old Bridge Inn. From here, follow the road up to the left to reach the main road to finish.